Ukrainian rioters are reigniting street clashes with police in the capital Kiev, with opposition MPs attempting to paralyze the work of the parliament. Protesters are stoning police, with law enforcement responding with tear gas and stun grenades. 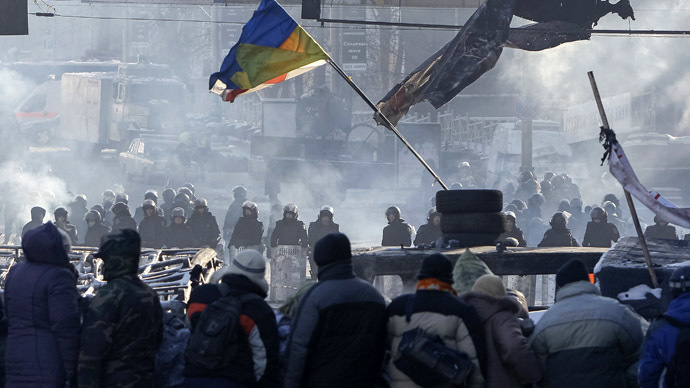 Security forces have started an anti-terrorist operation at Independence Square in Kiev. The Berkut police forces and three water cannon have gathered at the scene, while armored troop carriers have reportedly surrounded the square. Protesters are calling for women and children to leave the area immediately, while stun grenades are exploding at the scene. Three police officers have been killed in the clashes on Tuesday, according to the Interior Ministry. One died from a gunshot wound to the neck while being transported in an ambulance, the other died from a gunshot wound later in hospital. At least 157 police officers have have sought medical help, the ministry added in a statement on its website.Five soldiers from internal security troops have been shot in central Kiev. A pistol bullet was extracted from one soldier’s wound. Seven civilians died in the unrest on Tuesday, said the police, including one who died in the office of the Party of Regions, three in the House of the Officers, one from a gunshot wound on Mazepa street, two died of heart attacks at Institutskaya street, according to Interfax. One hundred and eighty five protesters have asked for medial help, Kiev’s health department estimated at 8 p.m. local time. Reportedly one protester lost a hand when shock grenade exploded. Several reporters, who happened to be in the thick of events, have reportedly suffered the effects of tear gas. Police are using rubber bullets against the rioters. Insurgents have captured several trucks blocking the way to the capital’s center, and set one of them on fire earlier on Tuesday. 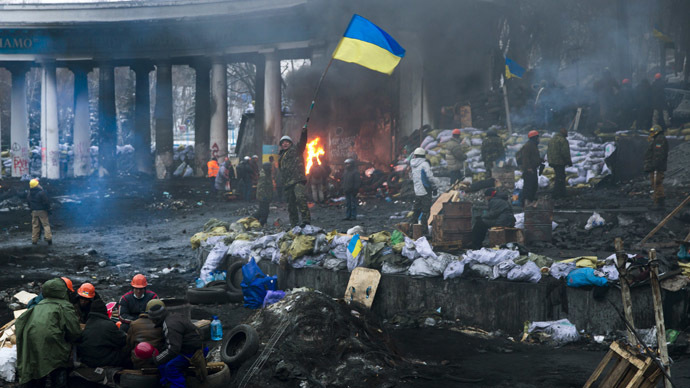 The rioters have set tires on fire on several streets leading to the Ukrainian parliament. They have broken up pavement stones to throw at police along with crackers and smoke grenades. Radical far-right extremists taking an active part in the clashes were chanting “Fascists!” to police in the afternoon. Rioters have used one of the captured trucks against law enforcement, driving it straight into police lines. 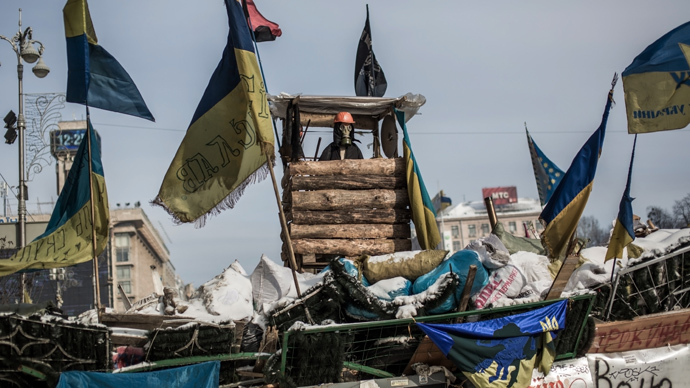 Protesters were attempting to reoccupy Kiev City Hall which was vacated earlier. 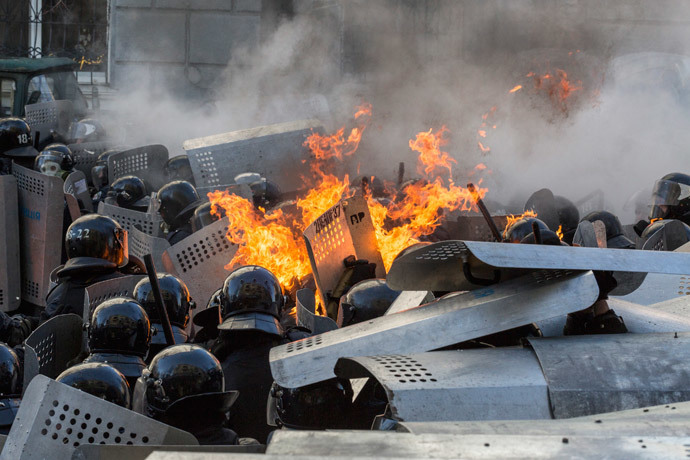 "Protesters are trying to seize Kiev City Hall, burning tires, and throwing Molotov cocktails at the building," said the press service of the Kiev police, as cited by Interfax-Ukraine. Ukraine’s Defense Ministry has ordered rioters to immediately stop occupying one of its buildings near parliament, which they had moved into earlier. "The leadership of the Defense Ministry demands that the protesters immediately clear out of the central officers' club and avoid provocative measures in future which can lead to an escalation of the situation," it said in a statement on its website.Ukraine's Security Service and the Interior Ministry in a joint statement have warned the rioters that if the "disorder" doesn't stop by 6 pm (1600 GMT), the authorities will restore order. A Molotov cocktail was thrown at building of the office of the ruling Party of regions as a fire started inside. After this the rioters broke in and ordered the staff out. About 20 women left the building through the burning front door, while some technical staff remained inside. The rioters burnt a car in the inner yard of the office building and attacked two cars that were leaving the scene. Police launched a counter-offensive against rioters soon after the office of the ruling party was captured. Over 2,000 police officers, backed by over 1,000 acting government supporters, cleared the party building of the malefactors and allowed firefighters to get on with tackling the blaze. 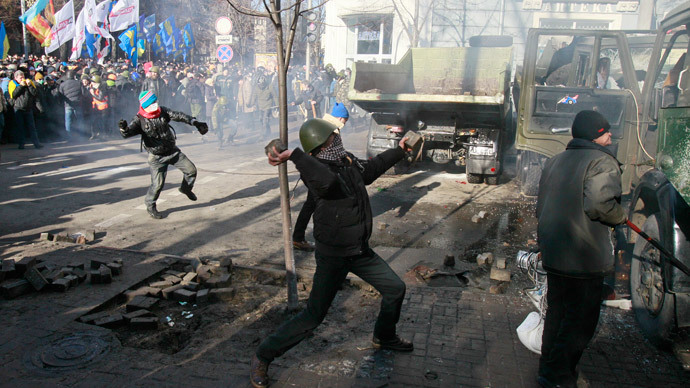 The rioters also claimed they had captured the Officers House in central Kiev. Molotov cocktails have also been used against police. Inside the parliament building about 50 MPs from opposition parties were blocking the the presidium and rostrum because the parliament’s secretariat refuses to register a draft law brought in by the opposition, claims ‘Fatherland’ party head, Arseniy Yatsenyuk. Opposition leader Vitaly Klitschko has issued a statement saying that his party, Udar, and other opposition parties are ready to form a new coalition government. 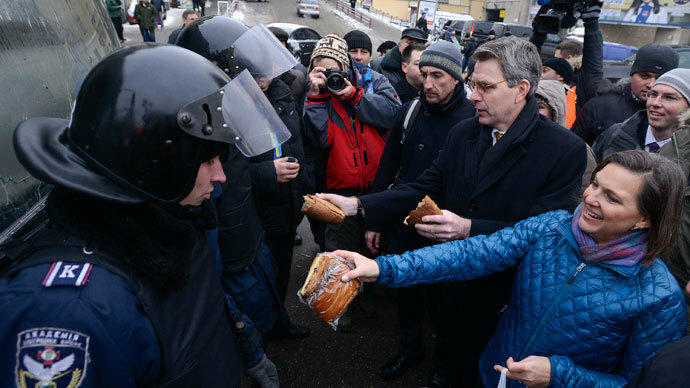 The opposition has blamed the violence on the Ukrainian authorities. 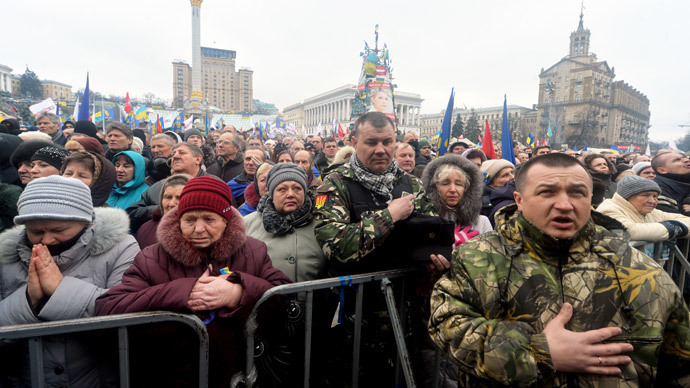 “The clashes on the streets have been provoked by the government,” claimed the leader of the far-right ‘Freedom’ party, Oleg Tyagnibok, who was among the leaders of the rally that started out this morning as peaceful, but in less than one hour turned violent. The opposition leader explained to journalists on Tuesday that in his opinion the authorities provoked the opposition several times. “First of all, they provoked us because they refused to register our draft documents in the parliament thus forcing us to block the rostrum,” claimed Tyagnibok. An ambulance was called for the chairman of the parliament, Vladimir Rybak, who was reportedly suffering from hypertension. The MPs of the ruling Party of regions reportedly were leaving the parliament building, because the party has opted not to vote in these kinds of conditions. 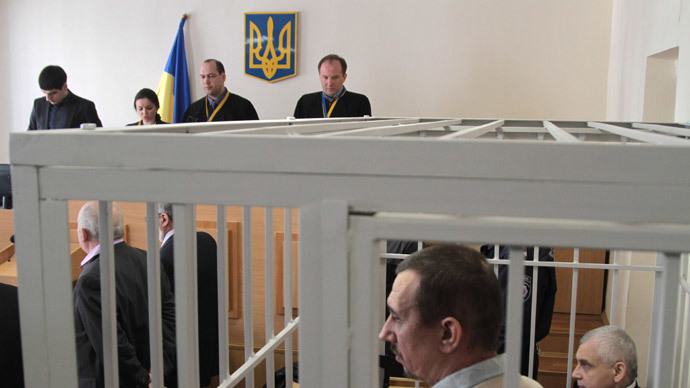 “A draft law cannot be registered if it violates the Constitution and parliamentary rules,” said Party of Regions’ MP, Yury Miroshnichenko, stressing that the opposition’s draft resolution is a call for constitutional change, which is in fact illegal. The ruling party suggested discussing changes to the current constitution in accordance with due process. Russia has called on the Ukrainian opposition to refrain from “threats and ultimatums” and engage in dialogue with the acting government. 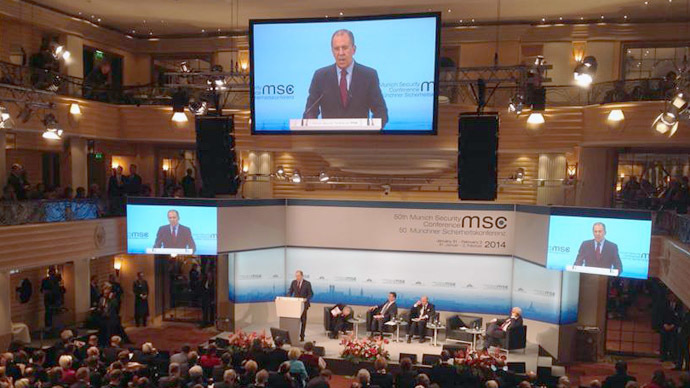 “What is happening (in Kiev) is a direct result of the policy of connivance on the part of those Western politicians and European structures, which from the very beginning of the crisis (in Ukraine) turned a blind eye to the aggressive actions of the radical forces in Ukraine, thereby encouraging them to further escalation and provocations against the legitimate authority,” maintains a statement from the Russian Foreign Ministry. 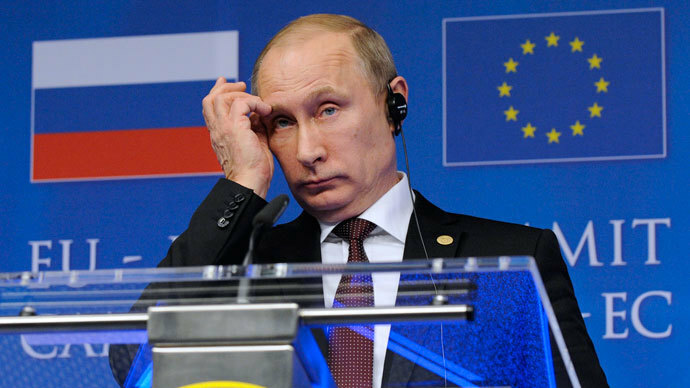 The EU criticized the escalation of violence on Tuesday. European Union foreign policy chief, Catherine Ashton said in a statement that she “condemns all use of violence, including against public or party buildings” and urges the country’s political leadership to resolve the crisis. US Ambassador to Ukraine, Geoffrey Paytt, called for dialogue, saying that those who “fuel violence will open themselves [up] to sanctions,” according to his Twitter page. NATO Secretary General Anders Fogh Rasmussen has appealed to both parties in the Ukrainian conflict to avoid an escalation of violence, according to the communiqué, published today in Brussels. On Wednesday Russia's deputy Foreign minister Grigory Karasin will hold consultations with Ukrainian counterpart Ruslan Demchenko. The meeting has no hidden agenda, stressed Russian diplomat, though the parties are definitely going to discuss the current situation in Ukraine. The opposition is demanding a return to the 2004 Constitution, which would make Ukraine a parliamentary, not presidential, republic. The ruling party insists that the opposition’s calls for constitutional change violate the Ukrainian Constitution per se. 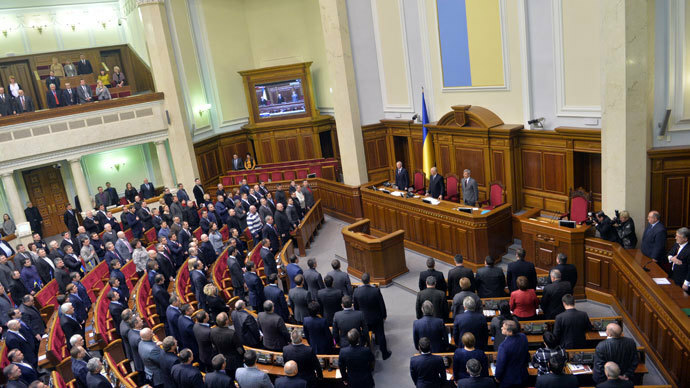 The opposition hopes to push in a resolution, stating that a 2004 decision of the Constitutional Court that the country returns to the 1996 Constitution has never been legally fixed, so Ukraine de-facto lives under the 2004 Constitution. A decade ago that decision helped the Ukrainian authorities to overcome political crisis in the country following a presidential election. As a result, then-president-elect Viktor Yanukovich agreed to a second term, which he lost to his opponent, Viktor Yuschenko.